Support of mobile (field) operations, remote from a Company’s “brick-and-mortar” offices, poses special and unique challenges for an organization. Increasingly, effective use of remote PC’s and PDA’s by field forces performing various functions, such as repair/service and sales, is becoming key to controlling cost, providing a high degree of customer service and remaining competitive. Beyond the needs of such field forces are the needs of the increasingly large body of those who work from home on a regular basis. Keeping them productive and in communication has become key to effective operations. How to effectively track and manage the asset base. From the user’s perspective the most difficult challenge is downtime due to required repairs. Repairs for most hardware and many software problems commonly require that staff return the loaded hardware to a central location for repairs and upgrades. Consequently, the user suffers downtime during the repair itself, as well as the time required to ship the unit back and forth, during which access is denied to company applications, systems, and e-mail. An efficiently run maintenance center can normally complete the work within two days, although total downtime, even optimally, is typically four days with shipping time. Because of the substantial impact of these realities, a key challenge to the support infrastructure is to optimize repair efficiency. 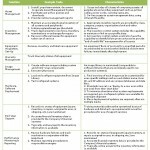 The tasks and characteristics of each function are summarized in the table, below. Support services can be provided via a range of business/organizational options: totally supported internally through totally “outsourced”. 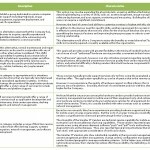 Along this continuum are a variety of approaches, any one of which might be suitable, depending on a company’s needs and preferences. Purchase hardware repair service contracts from hardware vendor. Outsource to traditional IT service provider, either a full service or specialized provider. Outsource to “Other” Hardware Maintenance Vendor. 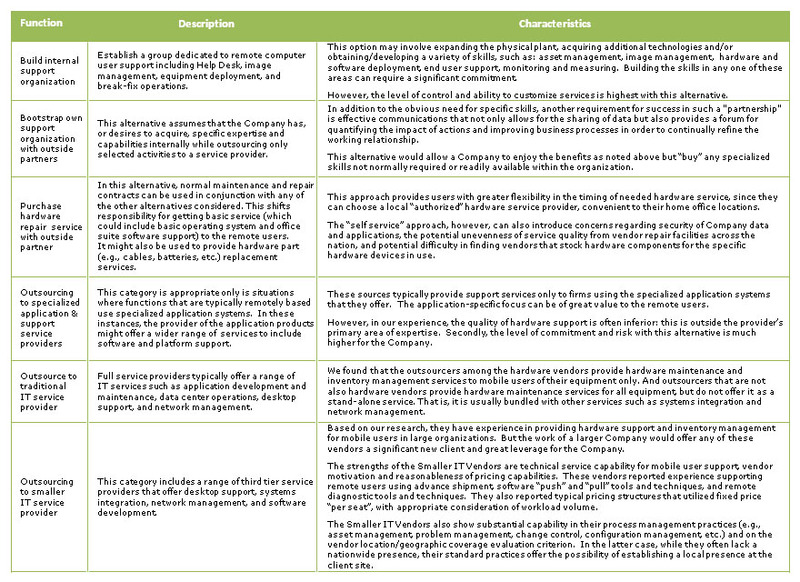 An analysis of the value of the several alternatives listed above is not constructive out of context of a specific business case. Factors such as the volume of users supported, the geographic distribution of users and the complexity of computing activities will affect the impact of provider characteristics. 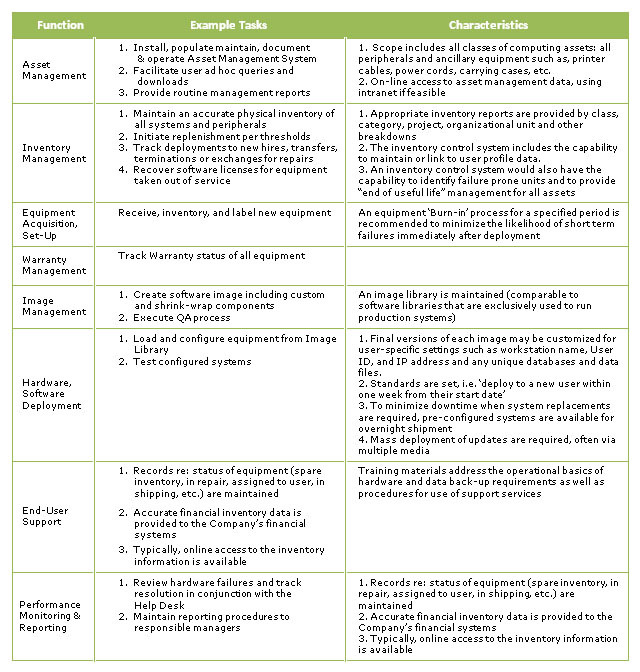 However, it is useful to explore the characteristics of the seven alternative service delivery methods that have been identified, as depicted in the table, below. The impact of differences in scale. Based on our experience, several approaches are available for consideration and many external providers are also active in the marketplace. As always, of greatest importance is the need to match your requirements to the available solutions: to find the “right fit” for your situation.